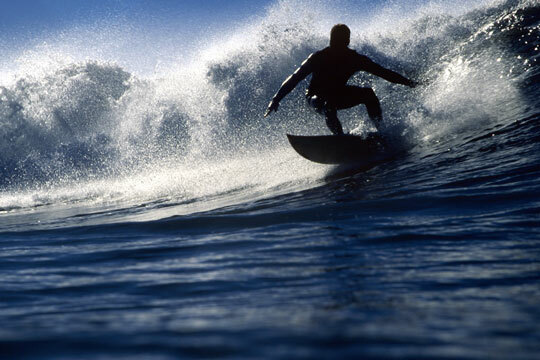 Surfers use skill, stamina and agility to ride a wave, either on a board or with the body. The term "surfing" most commonly refers to board surfing; "body surfing" is the term used to describe riding a wave without a board. Surfing is believed to have originated in the Pacific Islands. It has long been a cultural activity on the Hawaiian Islands, and British explorer Captain James Cook observed native Hawaiians surfing on his trip to the islands in 1778. They rode boards lying down, sitting, or standing. Surfboards are currently constructed of a plastic foam core covered with a shell of fiberglass and resin. High performance surfboards, known as shortboards, are used for speed and aerial maneuvers. They are 6 to 6.5 feet long, 47 cm 18.5 inches wide, less than 2.5 inches thick, weighing approximately 6 pounds. Longboards are about the same thickness as shortboards, but about 9 feet long and 20 to 22 inches wide, weighing about 15 pounds. The surfboard bottom has one to five fins near the tail which provide stability and turning capabilities. The three-fin design, also known as the thruster, is standard. Midsize boards are called funboards and provide a compromise between flotation and maneuverability. 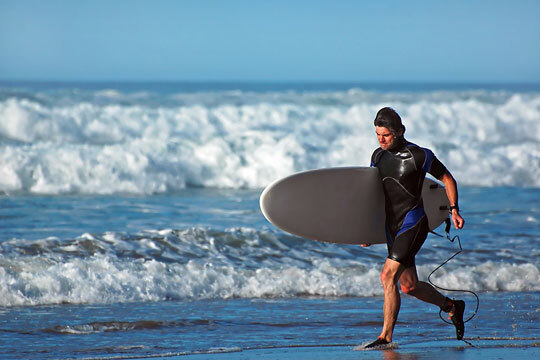 A leash attaches the surfboard to the surfer's ankle to prevent it from washing ashore or hitting other surfers. Surf wax and traction pads keep feet from slipping. Fins aid in board maneuverability, and can be interchangeable or permanently attached. Surfers may wear a swimsuit and rash guard in warm climates, and they require a wet suit in colder water. They may also wear boots, hoods, and gloves. Beaches that are long and gently sloping produce the best waves for surfing. As a number of waves gradually accumulate out at sea, they form a swell which travels toward shore. As the sea bed shallows, the swell takes on an elliptical shape. Eventually, the top half of the wave topples over and "breaks," causing a crest of foam called a whitecap. Upon "catching" a wave, the surfer quickly jumps to his or her feet and attempts to ride down the face of the wave, staying just ahead of the break. This is a difficult process to master as many things must happen simultaneously in this delicate balance. When a rider moves into the cylindrical portion of the wave, this is known as tube riding, and is one of the most difficult maneuvers in surfing. "Hanging five" and "hanging ten" refer to having one or both feet and toes hanging over the front end of the board. Turning sharply from the base of the wave up the face of the wave is known as a bottom turn. A cutback is a maneuver where the surfer turns the surfboard in the opposite direction while riding the face of the wave. A snap consists of sharply turning off the top of the wave and speeding down the wave face. Surfers use speed and momentum to ride over the lip and as far across the wave as possible in a move called the floater. Aerials are tricks, such as spins, performed while airborne. Riding with the right foot forward is referred to as goofy foot, and switch foot refers to the ability to switch between left foot forward (regular) and goofy-foot. The Association of Surfing Professionals (ASP) was founded in 1983, and governs professional surfing worldwide. Competition can be held in both oceans and wave pools. Surfers are judged on factors such as the size of the wave, distance ridden, and quality of maneuvers performed.